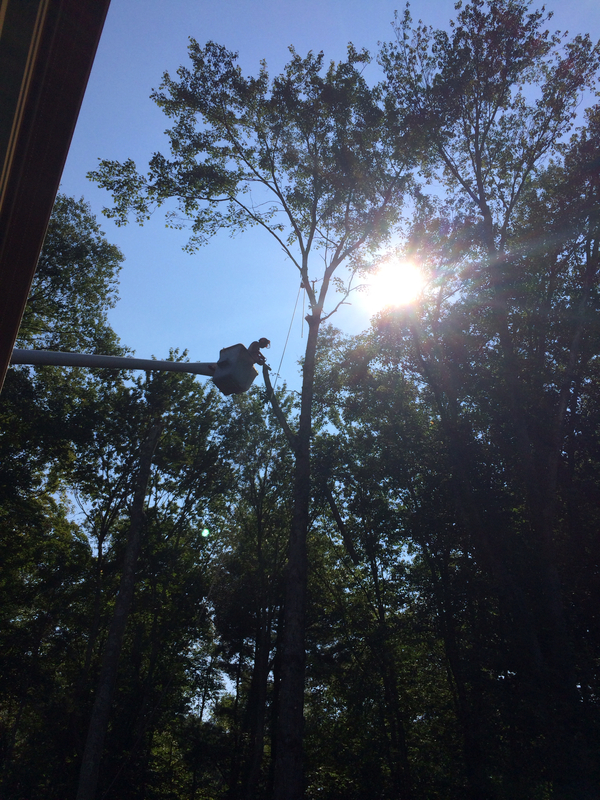 It began Tuesday with the arrival of two men, a bucket truck and a wood chipper. After sizing up "the job," and deciding how and which trees they would take down first, one climbed in the bucket truck and began maneuvering close to the first tree of twenty one trees...yep, twenty one! Then the next tree's branches were down and being chipped. Dropping limbs one at a time, the man on the ground was soon joined by three more. 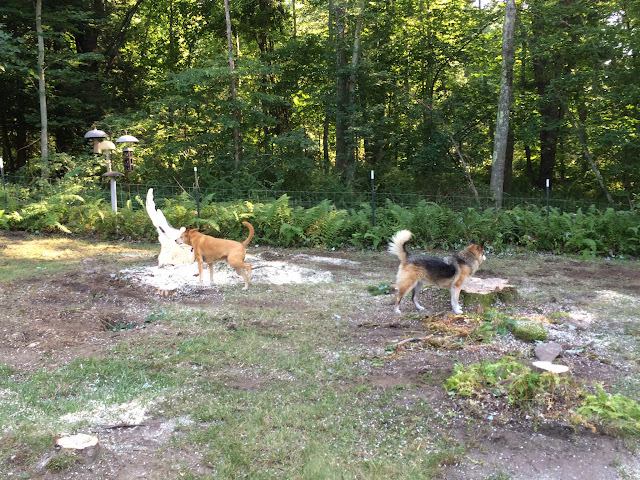 They moved so fast that the next thing I knew four trees were down and the log pile was growing rapidly as the pile of wood chips from the chipped branches! The Pres showed them where the logs needed to be stacked and the piles of chips were to go while I went in and got some snacks for the 5 man crew. 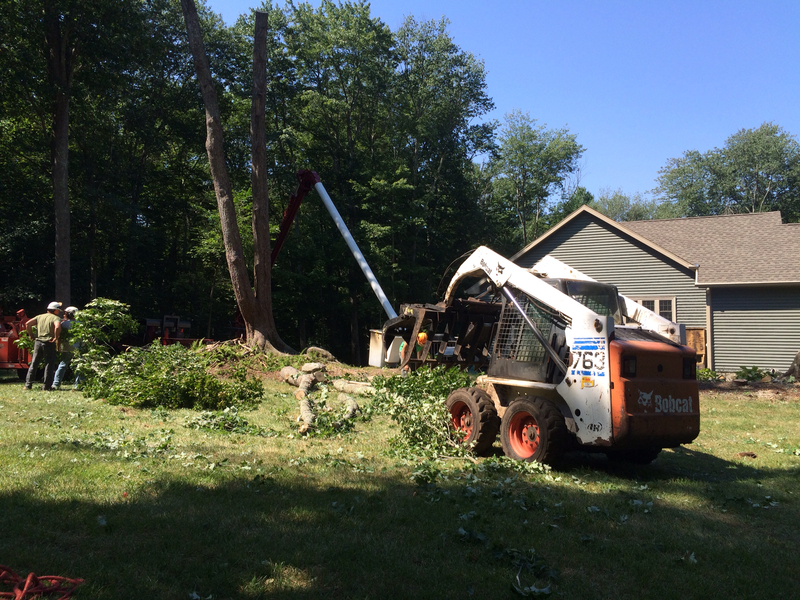 In six hours, ten 60-75' trees were removed, branches chipped, yard raked and blown with a leaf blower. Returning Wednesday, they predict they will finish the job with only 11 60-70' trees remaining. Only letting the dogs out when they took a break and or were done for the day was smart too. I was anxious to see what Moon and Copper's reaction was going to be in the morning when we go outside for our "normal routine". Not sure you can see what Copper is doing in the photo below (I did not crop intentionally) but since there was not a tree in his regular spot, it didn't seem to matter! He lifted his leg just like always...tree or no tree. No adventures fence hunting or finding this week. So, the fence I'm sharing this week is ours...more exposed than ever! Wow, they are working fast! I think it is funny Copper lifts his leg on the imaginery tree, lol. Enjoy your day! Great job, and your pups must really enjoy the area! Wow. That sure opened up your yard. They worked quickly and hopefully you get more light into the yard. 'i can see clearly now...' :) don't forget to link up! It sure is going to look different there when the work is complete! Gosh that's a lot of trees you had taken down. Did you just want more space? - Funny about the dog lifting it's leg anyway despite the trees being gone. - Yep you can see more of your fence now.